This article profiles Victor Neufer, who injured his ankle in a biking accident. Doctors found the 49-year-old Modesto resident had bone degeneration, spurs and other problems, and he wasn’t a good candidate for a fusion procedure commonly given to patients after years of suffering. Victor received Wright’s INBONE® Total Ankle implant. He is now able to walk again and expects a complete recovery to follow soon. Jeanne St. John, 65, has suffered from weak ankles since high school. She used to sprain her ankles doing simple daily activities. Doctors spent years looking for a solution that would work for her. Finally she received the INBONE® Total Ankle implant. Now Jeanne is able to walk without pain and stand under her own power. Years after Charlene Bennett’s broken ankle was healed, she still suffered from constant pain. Thanks to Dr. Drew Murphy, she is now pain free just nine months after an ankle replacement surgery with an implant from Wright Medical. Ankle replacement procedures are making a comeback thanks to several new FDA-approved artificial joints now on the market. Ankle replacement is more difficult and less common that other joint procedures like hip replacements. Bennett’s considers her surgery a success, and she is happy to have put away her wheelchair and crutches. Charlene Bennett, an elderly woman, was suffered for nine years from a previously broken right ankle. It eventually was subject to severe arthritis. She was facing either an ankle fusion or complete immobility until Dr. Drew Murphy told her about Wright’s INBONE® Total Ankle Replacement. Charlene has since regained her mobility and her quality of life. Steve Cassels, 63, has sprained his ankle over 40 times throughout his career as a basketball player and coach. His ankle problems reached critical levels when he had worn away most of his cartilage and was suffering extreme pain if he walked more than 10-15 minutes per day. Steve received the INBONE® Total Ankle implant from Wright Medical. Steve doesn’t plan to play basketball in the near future, but he is pain-free and leading an active, athletic lifestyle. 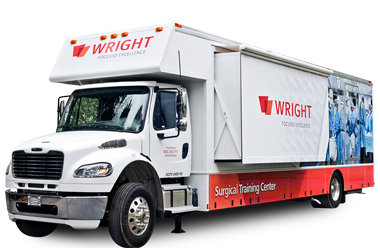 This article from The Commercial Appeal discusses Wright’s drive to become the top firm in the foot and ankle surgery market, and it also addresses how growth in the market benefits both the company and patients. Acquisitions of other providers and savvy selling have allowed Wright to shore up market share in a critical field that’s been comprehensively overlooked for a long time.